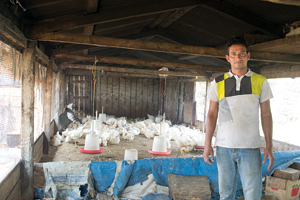 A story of a poultry farmer from a Far-Western district of Doti that represents a story of a community—a community that is transforming itself with the right mix of ability and access-to-finance through locally governed co-operatives. 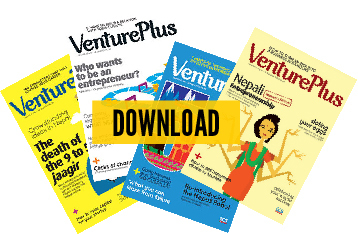 Ganesh Bahadur Bista, from a town called Budar in Doti district, is buying a delivery vehicle in a few days to transport his chicken production to neighboring towns. He is one of more than forty poultry farmers in Budar, which together constitutes a farmer’s committee and a co-operative that collects monthly deposits and offers loans when the farmers need them. The committee also helps the farmers make informed decisions regarding pricing, and is able to collect and share market information between its members. The farmers of Budar, today, supply chicken meat, chicks and chicken feed to several other neighboring towns in neighboring district. But more than a decade ago, when Bista first came to Doti there wasn’t any local poultry farmer, let alone an organized committee—at the time, people from Doti had only two landline telephones, and the electricity was sparse. He had come from a family in Baitedi that completely depended on farming. Baitedi, a district that lies on the higher regions of Nepali topography, had even less to offer—in terms of farming production, a market to depend on, and prospects for economic elevation. And as Bista had had some exposure to a major city—having been to Mahendranagar, he was determined to move to a lower region with arable lands, larger market and greater prospects. “As a child, I used to think a lot. I would tell myself I have to get out of this poverty. I still remember a teacher’s quote, back from sixth grade: ‘If a person desires, he can revive a dead tiger.’ So, I was determined to work hard and make things happen for myself,” says Bista. Bista saved around two thousand rupees, quit his teaching job, and opened-up a small eatery in the town. However, his circumstances were still tough. As the conflict in the country had culminated, security and economy was at its lowest, and the people were suffering. Bista was finding it hard to make ends meet. But one day a friend of Bista, Dhirendra Chand, makes a suggestion that turns out to be invaluable for Bista. Chand told Bista about boiler chicken farming and how lucrative it could be—rearing 150 chicks can help earn up to sixty thousand rupees. “I had never seen six thousand rupees in my life. When someone mentioned a potential to earn sixty, I shifted towards that,” says Bista. The poultry business seemed like a sensible addition to his eatery business. The produce from the new venture could at least provide him with supplies for his existing eatery. So, he asked around for some money and invested in 150 chicks. But it turned out that he was the only one in town to produce boiler chickens, and no one ate boiler chickens—it was either local chickens or goat meat. “The only thing boiler we can eat are potatoes’—they used to say,” says Bista. However, the local chicken could not keep up with the demand, and people started trying boiler chickens, which eventually became the favored taste. “Today, everyone eats boiler chicken. Not only that, we have customers who specifically want boiler chickens bred in this particular altitude. So, there is a special demand for our produce,” he adds. Since then, his poultry business has grown substantially. His poultry business has also helped him buy some land and build a house. It has helped him provide for his family of four, and send his daughter to a school in Mahendranagar—the ninth largest city in Nepal. And with his example many in his community has followed suit, turning the efforts of one into a capacity of a community. "Once you break it through to the other side, it’s all worth it"